This online portfolio provides a small sampling of some projects for which Kelly Griffin and KGA have managed, worked on and provided content. It’s a little trickier to have samples of social media postings, blogs (although you can read some of Kelly Griffin’s blogs here) and other online content because much of it is ghostwritten for another person or organization. Many other examples of traditional collaterals, plans, videos, and online examples of the work are available. Just ask. In the meantime, take a look at the portfolio here to begin. 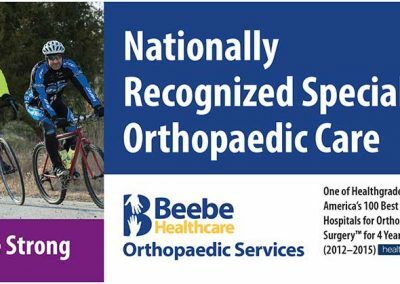 Beebe Medical Center went through a rebranding process in 2013 to create the look and feel of an independent, not-for-profit healthcare system. 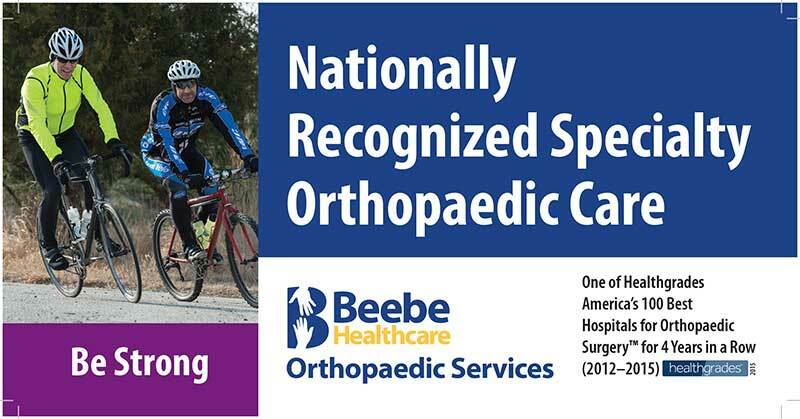 The rebranding included an updated logo, new colors, a new name, Beebe Healthcare, updated mission and vision. 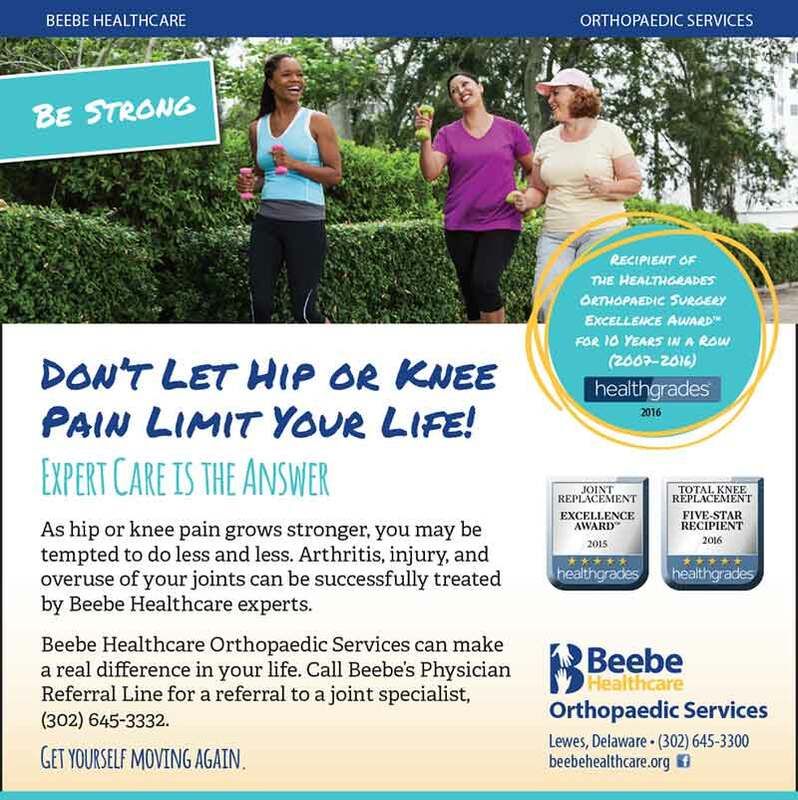 This ambitious process included redesigning all advertising, collaterals, the website, www.beebehealthcare.org, forms, advertising specialty items, just to name some of the projects. Kelly Griffin directed this process from beginning to end working with a brand consulting agency, project managing the design work and writing and editing along with her team. Other major achievements include the marketing of four walk-in care centers, several outpatient services locations and new programs and services. Many campaigns were created with consistent, compelling photos and content across traditional channels and online. Some examples from an Othopaedic Services campaign are available to see here. This health screening commercial represents another campaign that alerted healthcare consumers to the importance of health screenings. In addition, Kelly Griffin served as Public Information Officer at Beebe handling significant crisis communication challenges for this organization. She completed National Incident Management System (NIMS) training and participated in many local and statewide drills as well as real-time emergencies. She also drafted a crisis communications policy and plan. 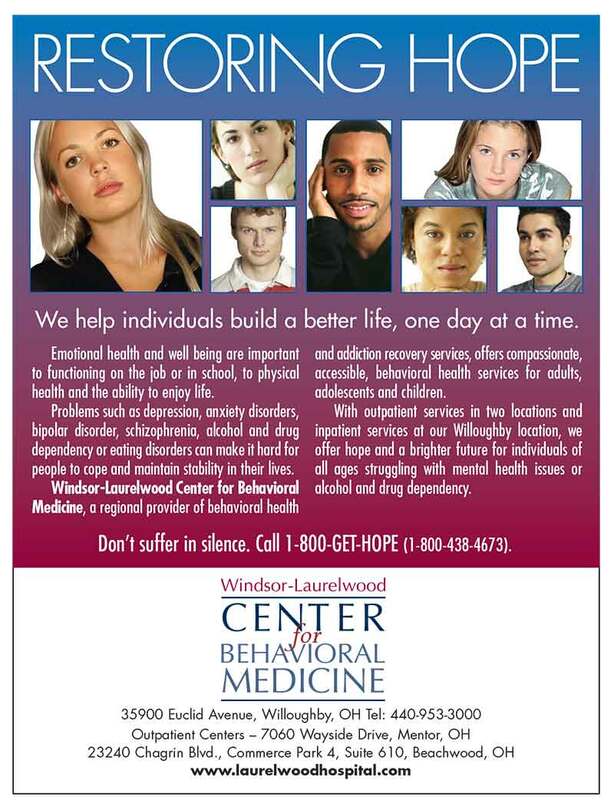 This organization (in 2005 at the beginning of the client-agency relationship, Laurelwood Hospital, becoming Windsor-Laurelwood Center for Behavioral Medicine in 2007 when Horizon Health, its parent corporation, merged with Psychiatric Solutions, Inc.), faced a significant challenge. 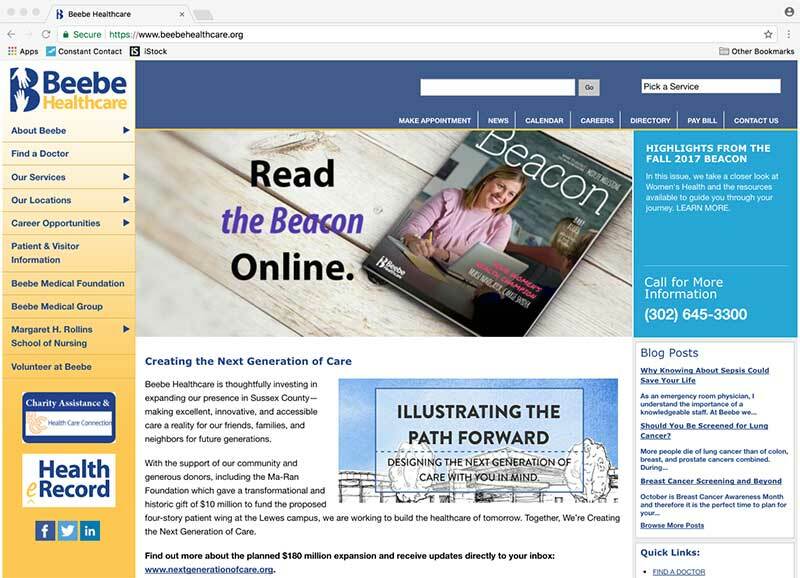 That challenge was to totally rebrand the hospital and behavioral health system with an updated logo, new marketing collaterals including new brochures and a new website. KGA, with a design partner, Damar Communications, recreated the image of this behavioral health system. In addition to the rebranding, KGA handled media planning and placement for print and cable television advertising, created the scripts and directed the taping of commercials, handled copywriting, feature writing, press release writing and project management. A diverse number of editorial projects were researched and written for the human resources division of this health system such as reports, white papers, articles, policies and procedures, and online content beginning in 2006. Kelly Griffin served as the project writer/editor for the WELCOA Well Workplace Awards application in 2007. The health system received the Gold level award. Kelly Griffin also served as project writer/editor for The Companies That Care Honor Roll application each year from 2006 through 2009. The health system achieved Honor Roll inclusion each year. So many traditional publications, award winning print and radio advertising, direct mail pieces, annual reports, brochures, it is difficult to choose. KGA can provide all kinds of examples of the work. Just ask. 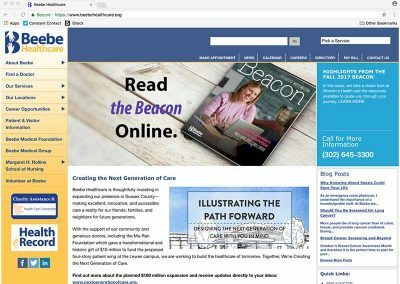 The hospital also created the second healthcare website in the State of New Jersey that included the usual – services and programs, medical and other professional staff bios, and an incredible number of consumer behavioral health education articles to help erase the stigma of seeking help for addiction treatment and mental illness. Always ahead of the curve, Carrier’s behavioral health communications were outstanding under the direction and management of Kelly Griffin. 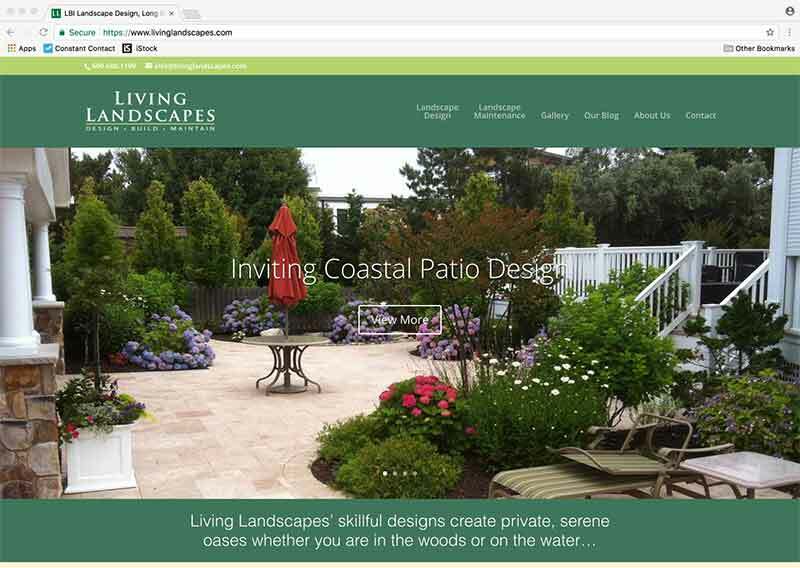 Living Landscapes, a landscape design and creation company known for its unique designs and artistic touches and based in Barnegat, NJ, has been a KGA client for many years. The most recent project was the complete redesign of the company’s website, www.livinglandscapes.com. This website is on a WordPress platform. KGA managed the project, tweaked and wrote content and partnered with website designer, KJanStudio, to complete this elegant website. This firm handles full-service information management and processes, allowing client firms to outsource a wide range of functions. KGA provided a number of services for companies owned by Oscar Robertson, famed NBA player and successful entrepreneur, from 2001 to 2010. For Oscar Robertson Solutions, some services included the development of marketing strategies, brand conceptual development and tag line, identified corporate strengths and weaknesses. Kelly Griffin also created the concept, developed the outline, wrote the copy for and project managed the work of her graphic design partner, Damar Communications, in the development of a comprehensive services brochure, as well as handling project management, website content development and site mapping. KGA also handled public relations services and other ongoing marketing and competitive research needs. Complete revision and update of corporate website for Educational Testing Service (ETS), Princeton, NJ. Kelly Griffin was part of the website content analysis and development team to revise and update the ETS website including analysis of ETS web pages and content, copywriting of new content, editing and update of current content. This seven-month plus project to recreate an approximately 5,000-page website culminated in a new ETS website in Fall 2005. As a subcontractor to agencies, KGA has rounded out projects and campaigns as a consultant and copywriter to advertising and marketing agencies and technology consulting organizations. Kelly Griffin is happy to provide examples and to sign confidentiality and non-compete agreements when she fills project and campaign needs. Whether it is traditional editorial writing, content creation for websites, blogs and social media, or copywriting, Kelly Griffin can fill the bill. Here are just a few examples. Just ask and she will provide more online links, PDFs, whatever you need. Best Practices in HR, a twice-monthly publication for human resources executives, contracted with Kelly Griffin for nine years until it ceased publishing. Kelly Griffin was a contributing editor/writer for this twice-monthly publication, writing more than 1,000 articles for 216 issues and for use on BLR’s websites and blogs as well. A few samples are provided here in the Portfolio. There are many more available. The publisher’s website is www.blr.com. Regional publishing company that is no longer in business produced new residents/tourists guides, county business profiles, Princeton: Culture, Arts & Living Magazine and custom publishing projects. KGA handled project management, strategic marketing consulting, editorial oversight, copywriting and editorial writing for a wide range of publications. Also held the position of Managing Editor, Princeton: Culture, Arts & Living Magazine, also writing some feature articles and project managed, wrote and edited a 60-page annual county business publication and economic profile. Family Guide – Regional publication for parents by the same publisher as Princeton Magazine. Middlesex County Business & Economic Profile – This was a one-time publication created for this NJ county through Media Resources Group. Project management, publication planning. writing and editing by Kelly Griffin and design by Damar Communications. The Heart of Lake County Magazine – Regional lifestyle publication for the suburban region outside Cleveland, Ohio. Some examples: Women’s eNews, NJ Biz, GetContactX.com, Freeagent.com, Pro2net.com (now SmartPros.com) and Careerbay.com. 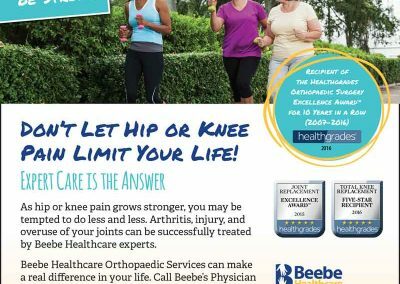 Articles targeted to consumers, independent contractors, business professionals, human resources professionals, insurance professionals, job seekers, individuals planning to relocate, managed care professionals and healthcare professionals. Samples are available. Just ask. Need outside project help to meet a looming deadline?